The Law of Attraction. The Law of Reciprocity. Universal Laws. But are they? These concepts are taught as “universal laws”, yet how can we say with total authority that these are really immutable laws? How would we know that? I believe they are truly theories and opinions. And on that concept-I would like to introduce to you a theory of my own, one that is the core of the concepts taught in the Golden Dragon Transformational Leadership Training, and in The Great Adventure: Your Quest for Money Mission and Meaning.As you might have guessed based on the title, the concept I am proposing is called the Theory of Connectivity. It pre-supposes that not only are you and I connected to each other through an invisible web of energy called ether, but that we are also connected to everyone and everything else on this planet, and in fact the universe as a whole. That connection is “the source”, God, Allah, Buddha Nature, call it what you will- it is all the same energy that is at the root of all life and all creation. Through our connection to this web of energy – we experience “miracles”, such as the heart in the sky in my previous blog posting, things or people showing up in your life just as you need them, finding the exact change in your pocket for that item that you did not know earlier you would be wanting to buy…you get the picture. I conclude there are 4 possibilities as to how and why this unfolded the way it did, exactly as I had seen it in a brief thought earlier in the day. 1)	I “created it” by thinking about it, as the Law of Attraction teaches. 2)	It was going to happen anyway, and I just had a glimpse of the coming future, as the Theory of Connectivity teaches. 3)	I have a basis of history with my uncle, a good idea of his personality, and I just extrapolated a likely outcome. 4)	We are all connected, I thought the idea and in essence “sent it out to the ether” – he picked it up and accepted it, and so it became reality. I will leave it for you to decide which one it might be, or if indeed it is a combination of all of them. Regardless, this type of phenomenon happens to us all on a regular basis, and what it shows us is that we are much more than we think we are, that we are capable of so much more than we think we are, and when we learn to become centered, open our hearts, live and lead from a place of love- these type of happenings become commonplace because we are in the flow- and life becomes easier and more joyful as a result. You experience better relationships, less fear, more peace of mind, less stress, better health, and a very good chance of a longer, happier, healthier life filled with love and joy and happiness. 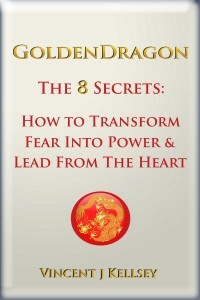 This is what we will be teaching in the fall at the Golden Dragon Transformational Leadership Training- not just how to be a more effective leader, not just how to lead people safely and effectively through amazing transformational experiences, not just how to master your mind and master your fear, but how to live in joy, with an open heart, peaceful spirit- and be an example of the type of life possible for anyone if they choose it.